Cathy graduated from Edinburgh University in June 1990. After graduating she worked all over the country in mixed practice, before deciding small animal work was definitely for her. Cathy joined Arden house in September 1997 as senior vet, and then eventually in 2000 bought the practice from Mr and Mrs Matthews. She then opened first the Greenford branch surgery in 2003, and later on the Harefield branch surgery in May 2007. At home Cathy has her very mischievous Labrador Sasha, and also two cats, four children and a tortoise to keep her busy. 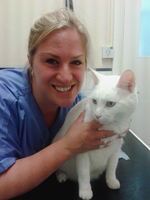 Katie graduated from Bristol Vet School in July 2000, and joined Arden House in 2004. Katie works every Tuesday and Thursday at the Ruislip hospital. Outside of work Katie loves all things homely - cooking, gardening and spending time with her husband and their two children. They have two cats Smartie and Whisper who are always up to mischief! Louise graduated in 2004 from The University of Glasgow. She grew up in Pinner and moved back to the area in 2015 with her husband Rob and two children. Sharing their home are cats, Basil and Betty and dog Mabel. Out of work, Louise enjoys family time, dog walking and Yoga. Lavanya started working at Arden House in September 2012 as a locum veterinary surgeon, but enjoyed it so much that she ended up staying! She graduated from Bristol University in 2003 and has worked in small animal practices since. She lives locally with her husband and their two young children. Lavanya enjoys all aspects of general practice, in particular the variety of cases – you never quite know what is going to walk through the door! Nigel graduated from the University of Edinburgh in 2014. Being a local lad, he completed many work experience placements at Arden House before joining us full time. In his spare time Nigel enjoys the outdoors (along with his Labrador Barry) & playing ultimate Frisbee, or relaxing in the evening playing video games! Kirstie graduated with a doctorate of veterinary medicine in 2016 and started working at Arden House in August 2017. She has particular interests in surgery and critical care. At home Kirstie enjoys running and yoga, or to go out walking with her dogs Beth and Maisie. Karolina arrived in London from Poland in June 2015 to start a new and exciting chapter in both her professional and private life. She graduated from the faculty of veterinary medicine in Lublin, Poland in 2012. She is interested in all aspects of veterinary medicine and is keen to gain many new experiences whilst working at Arden House. Karolina is mainly based at the branch surgery in Greenford and is enjoying getting to know the lovely pets and their owners. Karolina prides herself on providing a high standard of care to all the animals. Celia graduated from the University of Liverpool in 2016. She enjoys all aspects of veterinary medicine but has a keen interest in soft tissue surgery and ophthalmology. In her spare time, Celia enjoys walking and attempting to train her cheeky Norfolk Terrier, Kevin! Jazmin has worked previously at the RSPCA before coming to work at Arden House and train to become a veterinary nurse. She passed her exams to become a registered veterinary nurse in the Summer 2017. Jazmin has recently taken up the post of head nurse and is also a clinical coach teaching and support our student veterinary nurses in practice. She enjoys all aspects of nursing, especially the hands on element of nursing in-patients. At home, Jazmin is kept busy with her three dogs, Tilly, Toby and Ruby, her cat Calley and Lightning the tortoise! Dayna joined Arden House as a student in 2006, and gained her qualification in veterinary nursing in 2009. 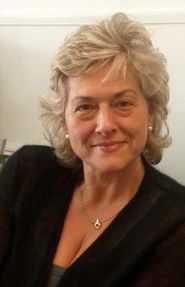 In 2011 she became a clinical coach and so takes an active role in the training of new students to the practice. 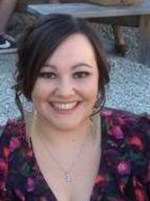 Dayna has an interest in alternative therapies, and is a qualified Reiki Master Practioner. She now splits her time between working at Arden House two days a week and looking after her daughter. At home, Dayna has her lovely horse Robin and naughty Jack Russel Terrier, Alfie. Avril has always wanted to work with animals and we are proud to say that after 2 years of hard work, she has passed her final exams to gain a Level 3 Diploma in veterinary nursing. ( April 2018). Avril has always had pets growing up and currently shares her home with her cat, Cleo, a very friendly Cocker Spaniel, Bobby and two guinea pigs, Bertie and Percy. Yasmin graduated in July 2016 with a BSc (Hons) degree in veterinary nursing. Yasmin first joined us as a university student nurse; part of her training involved practical placements in practice so that she could gain practical skills and work experience. Now a registered veterinary nurse, Yasmin works at our Greenford branch and organises the daily running of the clinic. She spends one day a week at the Ruislip hospital and this gives her the opportunity to carry out some 'hands on' nursing of the in-patients and catch up with colleagues. At home, Yasmin has an energetic Staffie X called Roy and his best friend, Rei the tabby cat! Shannon joined the Arden House nursing team after previously working at other practices where she gained some veterinary nursing experience. She now attends college once a week and receives practical training from the qualified staff in practice. At home Shannon looks after her cat Cleo and her Russian hamster Belle. In her spare time, Shannon enjoys socialising with friends. Becky is our newest member of the nursing team. She previously studied an animal management Diploma at Berkshire college .Becky enjoyed it so much that she decided to pursue a career in veterinary nursing. At home Becky has two rescue cats, Charlie and Winston. In her spare time Becky enjoys spending time with friends, baking and shopping. Denise is our receptionist at the Ruislip hospital. She has a love for all animals and their well being. Denise is the proud owner of two persian cats called Bubbles and Mischka who were homed from a rescue centre and a tiny Yorkshire Terrier called Penny. Her husband is aware that he comes 4th in the household! Anna joined Arden House Animal Hospital in December 2011 but had known Cathy since the 90s, where she worked with her in a small animal practice in West London.Anna and her husband have two adult children, Mairi and William, and in her spare time enjoys needle work, especially making children's soft toys. Gill joined Arden House in September 2010. She has previously worked in admin roles but is very pleased to have the opportunity to work at the branch practice in Harefield as she has always wanted to work with animals. Gemma works at the Arden House branch surgery in Harefield. She began her career with animals after carrying out a work experience placement here with us many years ago. She loved it so much that she came back to train as a veterinary nurse and continued to work at our Ruislip hospital for five years. After a break from nursing to care for her two children, Gemma is now back working at the Harefield branch. Animals are her passion and she has three cats and a collection of rabbits and guinea pigs at home. Position held: Practice Manager. Emma qualified as a Veterinary Nurse in her home country of New Zealand in 1999. She moved to England in 2002 and joined the Arden House in January 2003. After three years nursing, Emma decided to hang up her uniform and take on the role of Practice Manager. At home Emma has her lovely two sons and husband to keep her busy, along with Rooney the Jack Russell Terrier and cats Louie, Minnie and Primrose. Position held: Practice Manager. Natalie qualified as a veterinary nurse in January 2007. 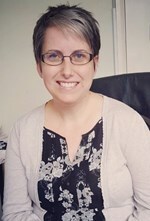 She started at Arden House in December 2009 as a nurse, but in May 2010 took on a new role in the office department with part time nursing, and later has stepped in as Practice Manager to cover maternity leave. Natalie now is the permanent full time practice manager. 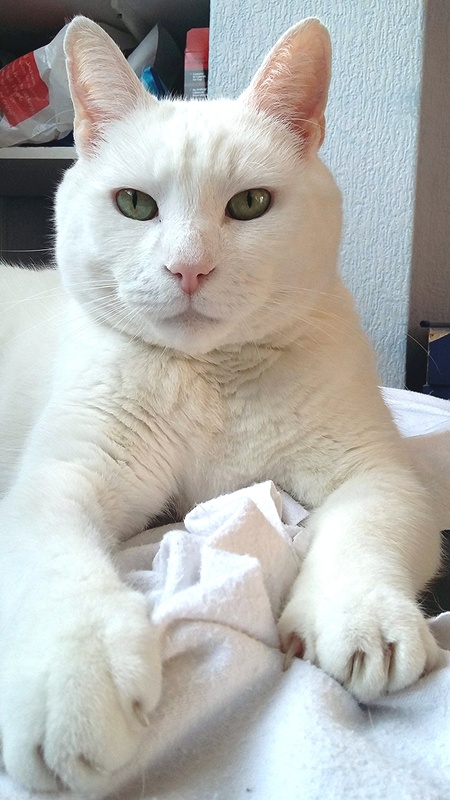 Natalie is the owner of Bubble the cat - he is a very loving and chatty boy! Position held: Admin Assistant. 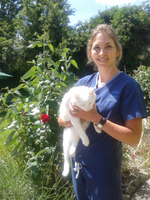 Wendy joined Arden House in 2002 after previously working in a practice as a veterinary nurse for 13 years. Wendy is part of our admin team and amongst other things has the job of organising the vet's rota. She still finds time to pop into the hospital ward to chat to the in-patients and give them a cuddle! Position held: Admin Assistant. Julie joined Arden House in September 2009 and carries out a variety of office duties including running the Arden House heath care plan and sending out vaccination reminders. She also works on reception. At home she has her lovely cat Lucky who she adopted from Arden House. Albert lives at Arden House and rules the roost! His most favourite thing is food! He has perfected the art of feigning hunger in the hope that the vets and nurses will give in to his demands. Albert loves to snooze but is also partial to a spot of mouse hunting, usually when the nurses have put him on a diet!